') }, });	}); What is LCD? How does a laptop LCD screen work? If you are visiting this site the chances are you know what an LCD panel is, found in the laptop lcd screens we sell but do you know how the LCD screen panel works? LCD stands for Liquid Crystal Display. We all know what “display” means but what is a liquid crystal? Liquid crystal’s discovery was made in 1888 by Austrian botanist Fredreich Rheinizer. We were taught in school during science lessons, that matter (everything around us) has three common states. Solid, liquid or gas. Liquid crystal is not a solid and neither a liquid, it can take both forms depending on environmental factors such as temperature. For this reason laptop computer displays can misbehave during very cold or very hot weather. Candles can be a solid or liquid when heated. Scientists in the 60s experimented with these liquid crystals by putting electric charges through them and discovered that they could with varying voltages alter the properties of light that passed through them. The laptop LCD display is manufactured in layers, like a sandwich, each layer pressed together to form one thin laptop LCD panel. The diagram below explains the different layers that make up the laptop LCD screen. The polarizer acts as a one way filter for the light, allowing the light from the backlight to pass through the layers of the LCD panel to the viewer but not the light from the outside environment to pass the opposite way. 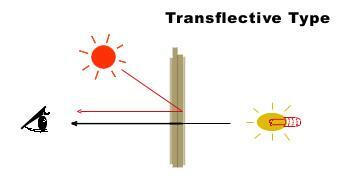 The type of polarizer usually found in laptop LCD screens is the transflective type, see below. The colour filter layer gives each pixel on the screen its own colour, the colour filter layer has blocks of red blue and green colouring the individual sub pixels that make 1 screen pixel. 3 sub pixels of red green and blue make up 1 screen pixel on the display. As you may have learned in science class red green and blue combinations as used in old fashioned television sets (CRTs) can be used to make up every conceivable colour the eye can see, all three make white and none of them illuminated will make black. Colour filter glass and TFT glass. In between these two layers is sandwiched the liquid crystals. Each pixel is made up of 3 sub pixels. An electric current is passed through each liquid crystal, making the crystal react by changing shape and therefore the amount of light allowed through the pixel. This illuminates each pixels brightness or shuts off that particular pixel. In the diagram below the left hand pixel is on and the right hand side yellow pixel is off as the liquid crystal changes form to block or allow light. There are many types of LCD display but the most common used in Laptop LCD Screens is know as TFT. TFT glass is given the name as it has many TFT’s (Thin Film Transistors). 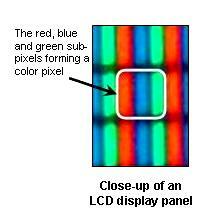 A TFT LCD panel contains specific numbers of unit pixels often called subpixels. 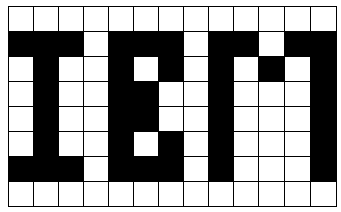 Each sub pixel has a Thin Film Transistor, which containts a pixel electrode (IT0) and a storage capacitor (Cs). If you want to get more technical than our beginners guide google search these terms given here. The backlight is responsible for putting light through the sandwiched layers all the way to your eyes where you see the image illuminated. Backlights are usually CCFL (fluorescent) tubes, small and very delicate, inside the lower part of the display. Some laptop screens, usually Sony models come with a double backlit screen where a fluorescent tube is fitted to the top and bottom to give a better more even brightness. You may have noticed some cheaper laptops have screens fitted that have a brighter appearance at the bottom than at the top. Newer screens are being fitted with LED backlights that use less power and generate less heat. They also have a longer life than a CCFL fluorescent tube. The inverter is not usually part of the screen itself. The inverter sits under the screen usually and looks like a long thin circuit board. The inverter takes a low voltage from the laptop battery (usually from the screen cable) and outputs a large 500v or more voltage to the usually pink and white or grey and white cable that comes from the bottom right of the screen and is attached to the CCFL fluorescent tube. The fluorescent tube requires a large voltage to operate and as such with the laptop on use extreme caution when handling the inverter and the cable that goes to the screen plugged into the inverter.